Charlotte Hodes graduated from Brighton Polytechnic near the beginning of Robin Plummer's period as Dean, 1975-89. She was a beneficiary of his enlightened policy of reserving funds for the purchase of work for the Polytechnic collection. Charlotte Hodes studied at Brighton college of Art, 1977-78 and at the Slade School, University College London where she complete her undergraduate and postgraduate studies in painting in 1984. She was Associate Artist at the Wallace Collection, London from 2005-2007, and Winner of the Jerwood Drawing Prize, 2006. Solo shows include Fragmented Images, Wallace Collection 2007, Drawing Skirts Baring Wing, University Gallery, Newcastle upon Tyne 2008 and Figures and Patterns, Flow Gallery, London 2006.Group shows include; Glasstress, Palazzo Cavalli Franchetti 53rd International Venice Biennale, Venice. Cartoon, Collage and its Decorative Motif, Eagle Gallery, London 2006. The European Design Biennale, Design Museum, London 2003 and Waste to Taste, Sotheby’s London 2003. In 2002 she presented an installation Cacophony, a cabinet of Vases for the series Digital Responses at the Victoria and Albert Museum, London. 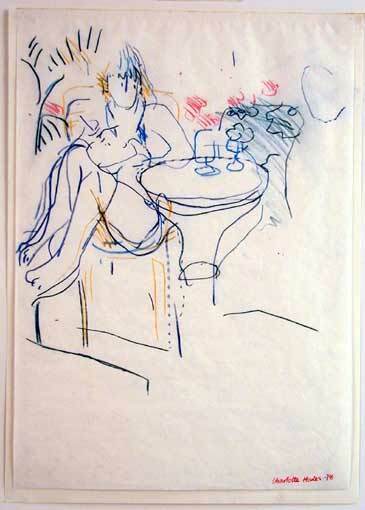 Title of Work:Woman at a Table Date:1978 Medium:Coloured pencil on paper. General Information: Old Acc No x13. Good condition.